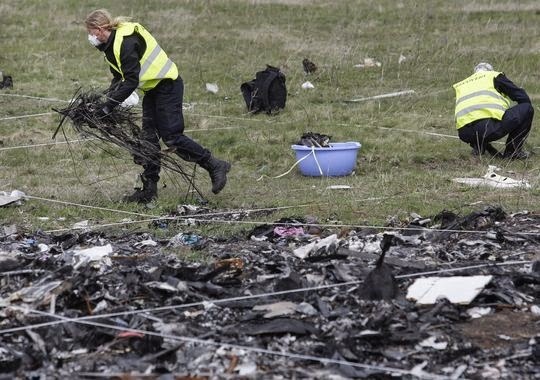 PETROPAVLIVKA, Ukraine -- Seven months after a Malaysia Airlines flight was apparently shot down over rebel-held Ukraine, the search for human remains, personal belongings and wreckage has ended. Investigators combed the crash site of Malaysian Airlines Flight MH17 near Donetsk, Ukraine, on April 16, 2015. The final seven coffins containing remains arrived in the Netherlands on Saturday. "Humanly we have done all that was possible," Pieter-Jaap Aalbersberg, head of the mission, said Thursday after a team of 30 Dutch, Malaysian and Australian experts made a "final last stroke" of burn sites and nearby fields. He acknowledged that more remains or wreckage might be found in the future. Flying from Amsterdam to Kuala Lumpur, MH17 disintegrated over the self-proclaimed Donetsk People's Republic and crashed July 17, killing all 298 people aboard, mostly Dutch citizens. Recovery efforts were suspended because of fighting and winter weather in the mountainous area near Petropavlivka, about six miles west of Grabove, where most of the debris fell. Wreckage was spread over 27 square miles. When the mission resumed in mid-April, searchers found more wreckage, "many more" body parts and personal belongings, including passports, watches, jewelry and photos, Aalbersberg said. All but two of the dead have been identified, and officials hope DNA testing will identify the final victims. Citing an unnamed "informed source," the Ukrainian news agency Ukrinform reported that search crews had collected about 17 tons of "debris," including personal effects, but "still need to take everything out." Investigators believe that a Russian-made BUK missile, launched by either Russians or pro-Moscow separatists, hit the aircraft. Separatist leaders and the Kremlin have denied responsibility, blaming the Ukrainian military. A preliminary Dutch report said the Boeing 777 jetliner broke up after being penetrated by "high-velocity objects." A final report by the Dutch Safety Board is expected around October, spokeswoman Sara Vernooij told AFP on Thursday.